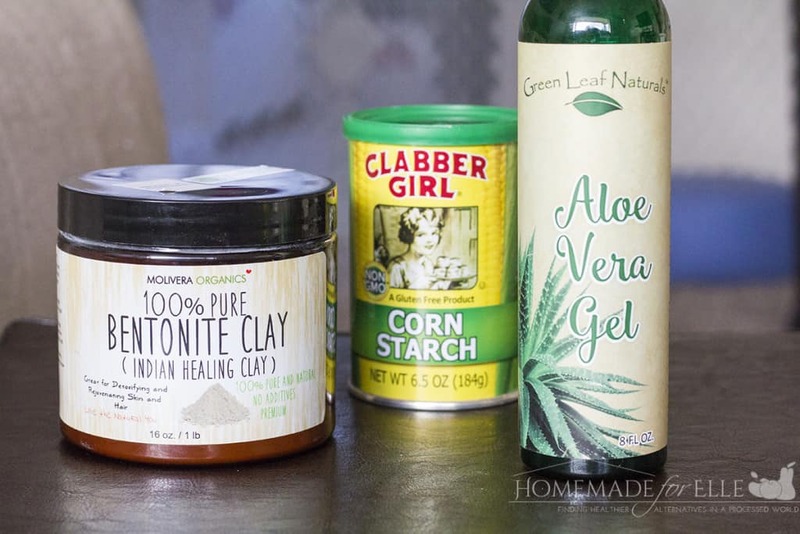 Do you want to learn how to make your own homemade eyeshadow primer? Keep reading to learn how! As a working mom that flies out the door at 7:00 in the morning, and doesn’t make it home until after 5 in the evening, I get one shot at my makeup in the morning. Whatever I manage to get on my face in the 5 minutes I get to do my makeup, is what I present to the world that day. For this reason, I feel like I have perfected the process of putting on makeup that needs to last all day, in a short amount of time. One of my secrets to keeping eyes looking great is to use a homemade eyeshadow primer. What do homemade eyeshadow primers do? They help prevent eyeshadow from creasing and fading by creating an invisible barrier between your skin and the makeup. Your skin has natural oils in it (which your skin needs and appreciates! 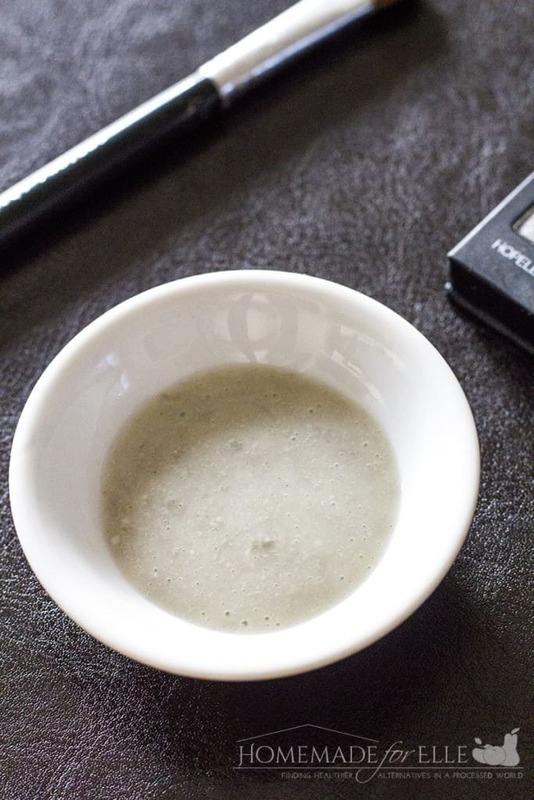 ), but those oils can make your eyeshadow look a little bleak, fragmented and non-existant after a few hours of wear, so a homemade eyeshadow primer can keep it looking better, for longer. I am a fan of making my own, wherever possible. For one, it saves you quite a bit of money. 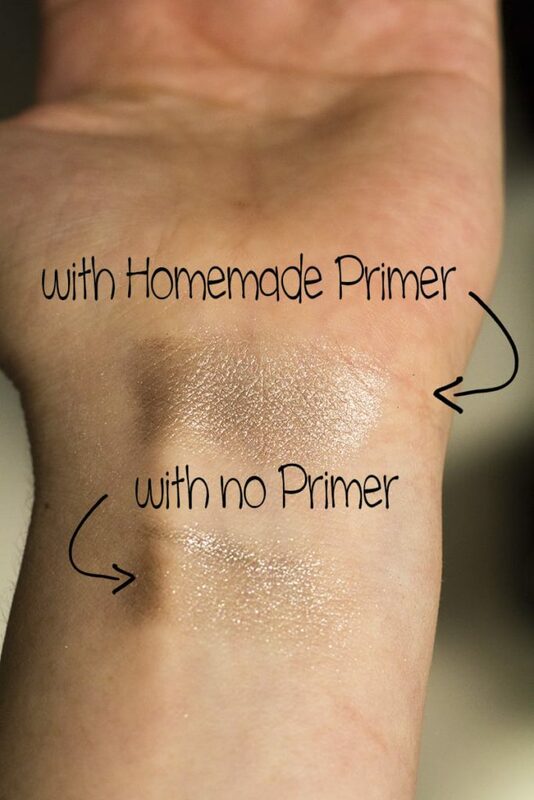 You will pay $5 and up for a small tube of eyeshadow primer, and the cost of this homemade eyeshadow primer is much, much less per batch. Secondly, you can control the ingredients that go into your homemade eyeshadow primer. The recipe below contains only 3 ingredients, which are all natural and safe. 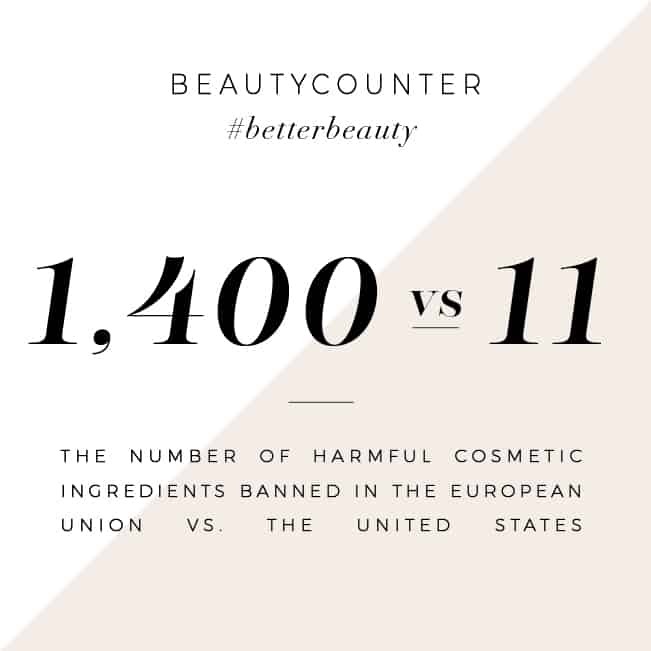 No preservatives, no chemicals, no artificial ingredients. Combine all ingredients in a small bowl and mix well. Transfer to a container with a lid. Store in the refrigerator for up to 2 weeks. The consistency of the homemade eyeshadow primer will change as it sits in the fridge, but it still works well. To use your homemade eyeshadow primer, take a tiny bit of the primer and rub it onto your eyelid. Allow it to dry (should only take 15 – 30 seconds), then apply eyeshadow. In the picture above, I put homemade eyeshadow primer on my wrist. Then I put on eyeshadow over the primer, and put eyeshadow on a few inches lower (no primer). I used the same application for both spots. You can easily see the difference! Want to print this out to hang on your bathroom mirror or to share with a friend? Here is a printable recipe for you! 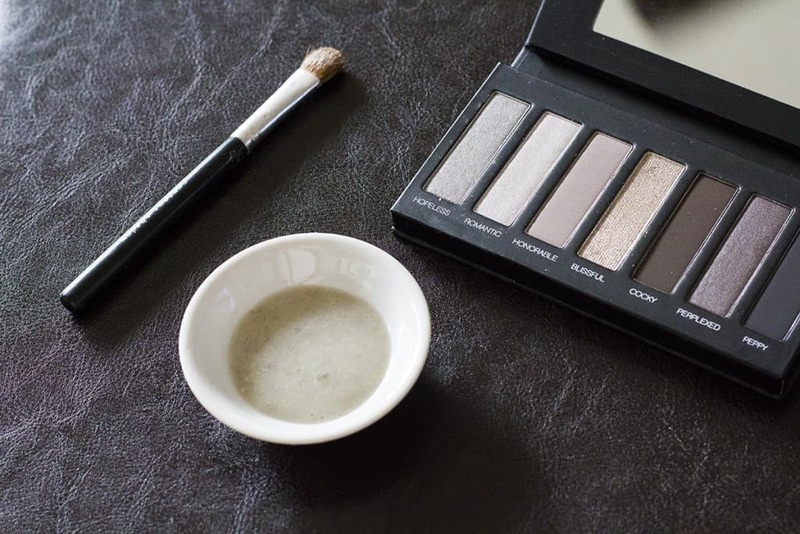 Want to try this homemade eye shadow primer, instead of making it? No problem – I’ve got you covered! You can buy this handcrafted item at my Etsy shop! 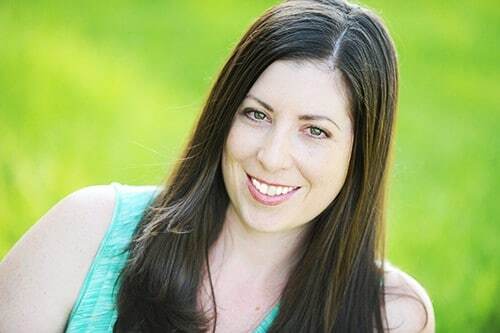 Take the 52 Week Natural Beauty Challenge! That’s awesome and those are my colors. I will be trying it this weekend! Add tea tree directly to your shampoo and conditioner, or try this homemade remedy: Tea tree scalp treatment: 4 drops tea tree essential oil 4 drops lavender essential oil 2 drops cedarwood essential oil 4 tsp coconut oil Massage the blend into your hair and scalp and leave it in for about 30 minutes, and then shampoo it out. I just loved the shade made at home. I can’t believe one can actually make Such awesome eye shadow at home. I am going to need some tips about make up making at home. Can I make this without the clay? I do not have any and want to try this out as soon as possible. Question, Why does the mixture cake up? I followed the instructions and when I start to rub it on the eyelids they clay/cornstarch teams to ball ups. Hi Joanne – I am not sure, as I didn’t experience that. How long after creating the product did it start to ball up? Do you have to refrigerate it? My teen daughter uses primer religiously and the cost does add up. She’s going to be so excited to save money by making her own!